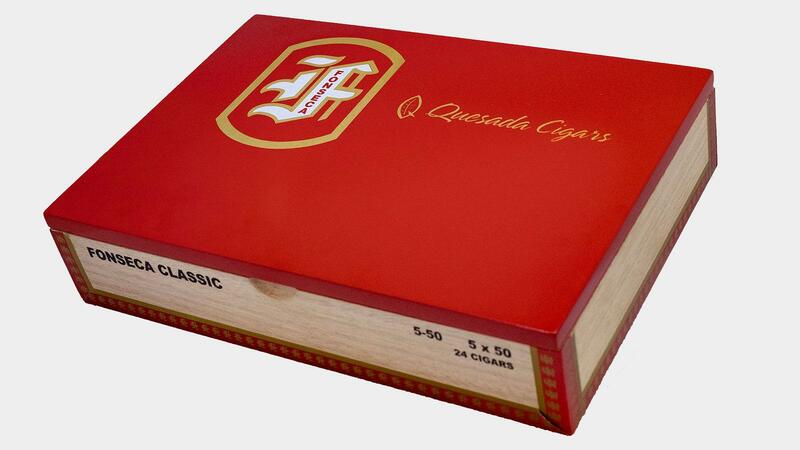 If something red and glossy catches your eye at the tobacconist in a few weeks, it could very well be the new boxes for the Fonseca Classic brand, which have been redesigned to command more attention in the humidor. The launch event for the new presentation is taking place on November 28 in New York City at the Nat Sherman Townhouse. According to Quesada Cigars, only the packaging for Fonseca Classic has changed. The mild blend (Connecticut wrapper, Dominican binder and filler) will remain the same. Brand owner Manuel Quesada, however, said that newer crops and more recent harvests have yielded slightly stronger tobacco, so the cigars have a bit more strength than in previous years. Made in the Dominican Republic, Fonseca Classic is available in four sizes: 5-50, which measures 5 inches by 50 ring gauge; 10-10, 7 by 50; 8-9-8, 5 1/2 by 43; and 2-2, 4 by 40. The 2-2 size is available in boxes of either 10 or 50 cigars. To maintain brand continuity, all other Fonseca cigars within the portfolio will have the same primary band with a secondary band denoting the blend: Fonseca Vintage, Cubano Exclusivo, Cubano Limitado and Nicaragua. The other Fonseca brands will have new, bright red box lids as well.